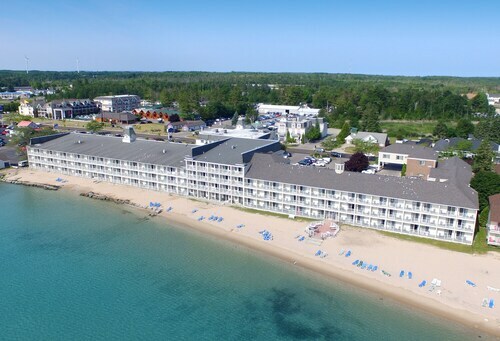 Nestled on the beach, this Mackinaw City hotel is within a 10-minute walk of Mackinaw City Ferry Terminal, Mackinaw City Dock, and Animal Tracks Adventure Golf. Mackinaw Manor Haunted Mansion and Spy Quest Laser Maze are also within 10 minutes. 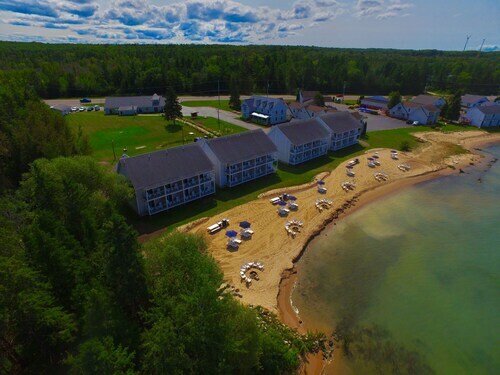 Nestled on the beach, this Mackinaw City motel is within 1 mi (2 km) of Mackinaw City Ferry Terminal, Jack Pine Lumberjack Show, and Animal Tracks Adventure Golf. Mackinaw City Dock and Wawatam Park are also within 2 mi (3 km). 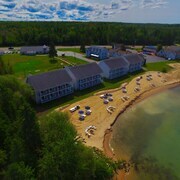 Located in the heart of Mackinaw City, this hotel is within a 10-minute walk of Colonial Michilimackinac Park and Old Mackinac Point Lighthouse. Mackinaw Bridge Museum and Mackinaw City Dock are also within 15 minutes. 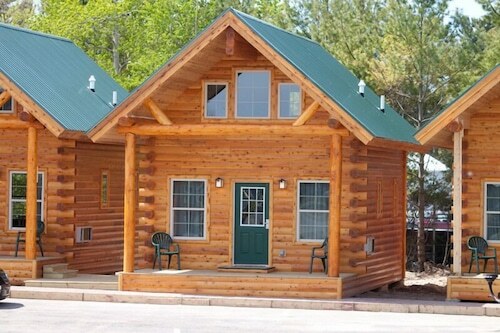 Located in the heart of Mackinaw City, this cabin is within a 10-minute walk of Mackinaw City Ferry Terminal, Animal Tracks Adventure Golf, and Mackinaw Manor Haunted Mansion. Spy Quest Laser Maze and Mackinaw City Dock are also within 10 minutes. 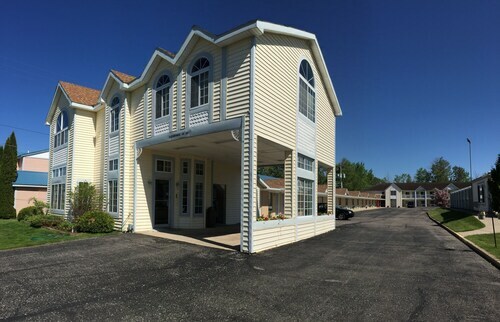 Located in the heart of Mackinaw City, this motel is within 1 mi (2 km) of Mackinaw City Ferry Terminal, Animal Tracks Adventure Golf, and Mackinaw Manor Haunted Mansion. Spy Quest Laser Maze and Mackinaw City Dock are also within 1 mi (2 km). 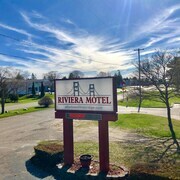 Situated in Mackinaw City, this motel is within 1 mi (2 km) of Mackinaw City Ferry Terminal, Animal Tracks Adventure Golf, and Mackinaw Manor Haunted Mansion. Spy Quest Laser Maze and Mackinaw City Dock are also within 1 mi (2 km). 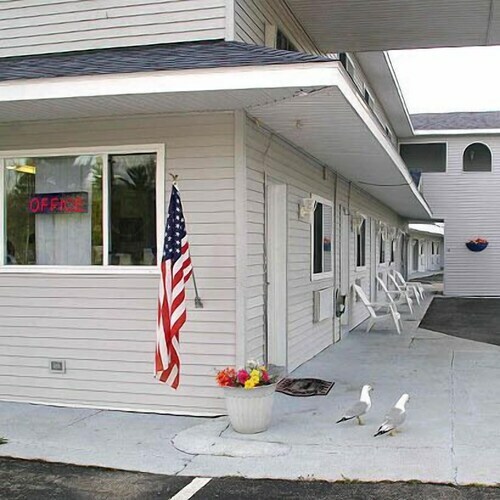 Located in the heart of Mackinaw City, this motel is within a 5-minute walk of Mackinaw Bridge Museum and Mackinaw City Dock. Spy Quest Laser Maze and Mackinaw Manor Haunted Mansion are also within 10 minutes. 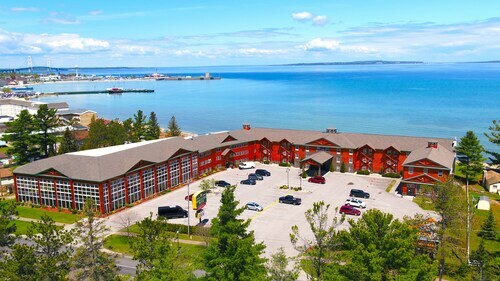 This family-friendly Mackinaw City motel is within a 15-minute walk of Mackinaw City Ferry Terminal and Animal Tracks Adventure Golf. Wawatam Park and Colonial Michilimackinac Park are also within 1 mi (2 km). 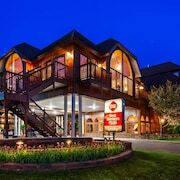 This family-friendly Mackinaw City motel is within a 15-minute walk of Mackinaw City Ferry Terminal, Animal Tracks Adventure Golf, and Mackinaw Manor Haunted Mansion. Wawatam Park and Colonial Michilimackinac Park are also within 1 mi (2 km). 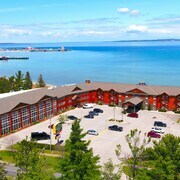 How Much is a Hotel Room in Mackinaw City? 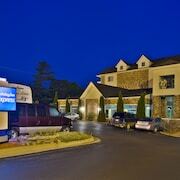 Hotels in Mackinaw City start at $58 per night. Prices and availability subject to change. Additional terms may apply. When you are deciding where your base will be while in Mackinaw City, you'll have a broad range of desirable possibilities. 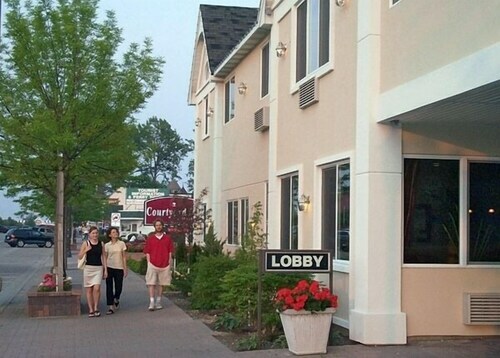 Wise travelers will find 41 hotel establishments just a short drive from Mackinaw City's urban center on Travelocity's comprehensive lodging section. 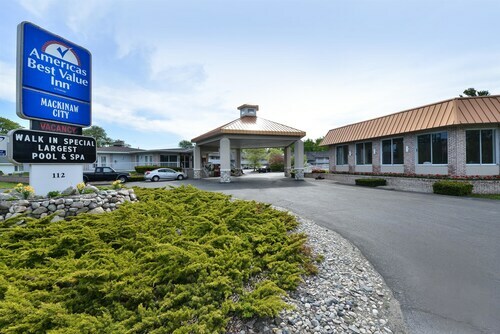 Lodgings that you can discover within strolling distance of Mackinaw City's downtown precinct, are the Mackinaw Beach & Bay Inn & Suites and Crown Choice Inn & Suites Lakeview & Waterpark. 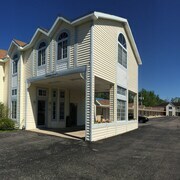 If you're traveling on a tight budget, you'll be delighted to find that there's a broad range selection of mid to low-budget rooms and apartments in Mackinaw City. The Bridge View Motel & Condo's and the Thunderbird Inn are alternative lower priced hotels that you could look into. 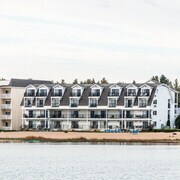 Have a look at the Hotel Iroquois and also the Island House Hotel. 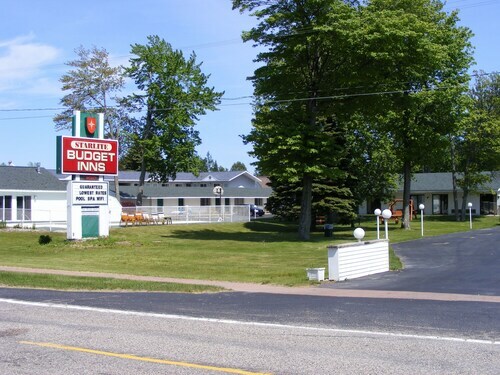 The Hotel Iroquois is located just 9 miles (14 kilometers) from central Mackinaw City. The Island House Hotel, is situated only 9 miles (15 kilometers) away. Other possible hotels are the Lake View Hotel and the The Inn At Stonecliffe. Once you and your family have spent some time in Mackinaw City, why don't you explore a bit more of the region? The Northern Lower Peninsula area boasts many things to offer tourists. Visit Northern Lower Peninsula's lighthouses. Those who love nature could also leave time to admire its lakes and rolling hills. Enlightened travelers in this corner of United States of America adore snowboarding. Simply because you and your traveling partners are on vacation in Straits of Mackinac, should not have to mean you can't fuel your love of sports. Discover Otsego County Sportsplex 50 miles (83 kilometers) to the south of Mackinaw City. Modern travelers that enjoy the idea of sleeping in the vicinity, reserve a room in the Holiday Inn Express Gaylord or Hampton Inn Gaylord. If you choose to fly into Mackinaw City, Pellston Regional Airport is the most convenient gateway. It's 13 miles (21 kilometers) from downtown. Pellston Lodge Magnuson Hotel is close to the airport. Clean room, very friendly owner, enjoyed our stay. The hotel was nice and right on the water. The breakfast was hot and the staff was friendly. My kids, ages 8, 4 and 18 months loved the little water park. The pictures don't do it justice. We had a great time. Was given information regarding location of complimentary breakfast within hotel, however in the morning found it to be closed. Checked with desk clerk and she directed us across the street to another hotel in order to get it. I found the there was a lack of elevators in both hotels. Only one i each and at the opposite end from lobby. Hotel was easy to find in the dark. Big spacious room. Little “mom and pop” type dining for breakfast.